Security in the Far East and trade between Russia and China will top talks at the table as President Dmitry Medvedev commences his three-day visit to China. 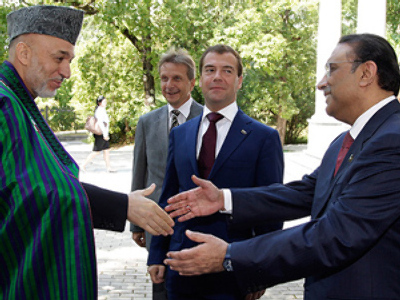 The leaders of the two countries often meet during international summits, but such is the importance placed on their ties, they still have plenty more to do. It is no coincidence that the beginning of this three-day-three-city visit began in the city of Dalian. Formerly known as Port Arthur, it was liberated by the Soviet Union at the end of World War II and also served as a fortress during the Russo-Japanese war. China and Russia very much understand what a tremendous history they share and try to remember that as they work on building their modern strategic partnership. A good example of that is that the first stop on this visit by President Medvedev was the Russian cemetery, in fact the largest on Chinese territory, which holds the remains of soldiers from both World Wars as well as the Russo-Japanese war. This year marks the 65th anniversary of the victory over Nazi Germany and Axis powers and to commemorate this fact a special ceremony was held, as well as the meeting with Chinese and Russian veterans. The next stop is Beijing, where many high-level talks are scheduled. 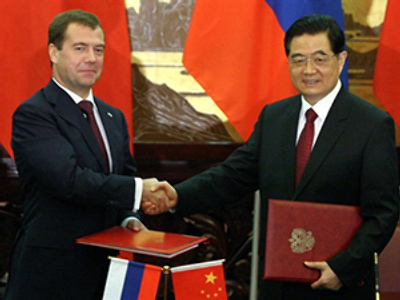 President Dmitry Medvedev will be meeting with his counterpart Hu Jintao and China’s Prime Minister Wen Jiabao. The issues on the table are political and economic ties, trade, boosting investment and energy co-operation. The third city to be visited is Shanghai.